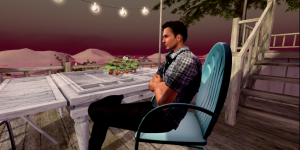 James’s Story – Virtual Ability, Inc.
I’m James, and I am Suellen’s partner in both RL and SL. I stumbled upon Virtual Ability a few months after entering Second Life, early in 2011. I had originally entered Second Life after reading an article about Online Support here, in the magazine put out by the National MS (Multiple Sclerosis) Society. To be honest; the first time I came to SL, I very quickly gave up. It was too complicated. It took some time (perhaps months, or even a year or two?) before I tried again, with my current avatar. To be even more honest, the second time was very difficult as well. While I did get going a bit better, I still had lots of difficulties. I could not find the MS Support group, at that time, since I had no idea of how to ‘search’ for anything in SL. I experimented with various avatars and, very short order, a kind lady took me to the open island of VAI, and I made my first contact with Gentle Heron. Gentle was (of course) completely wonderful to me, and soon I found myself a member of Virtual Ability. And I was suddenly learning much more about both SL, and all of the wonderful avenues of support for PWDs (Persons With Disabilities) here in SL. The main thing which keeps me coming back to VAI is that here, I can feel completely accepted for who (and what) I am. Outside of VAI, there is always a certain background air of judgmentalism in so many places. Yes, being able to feel that I am an accepted member of a community of equal ‘peers’ is the number one reason I keep coming back to VAI. Another reason is that the great folks here help me to feel that I am an important part of VAI. As a disabled man, for the first few years I struggled with feelings of worthlessness. VAI has washed away the last few stains of that early inner discord. Whenever I am able, I try to step up and do whatever the VAI leadership has asked me to do. I like knowing that I am helpful to VAI and our members even when all I am able to do is simply show up and participate. Here I have been able to participate in so many diverse events, and help so many people in so many different ways. VAI not only offers us a chance to do ‘good things’ here in SL, but many of the things we learn here in VAI help us to directly improve our ‘Real’ lives! VAI has made a major impact in my life. It has helped to restore my somewhat shaken sense of self-worth. It has given me that feeling of ‘community’ that even an introvert like myself still needs to feel. And it continues to offer me new and interesting ways to help myself, my wife, and many others. When I mention VAI to others, I tell them that it is a Real Life Non-Profit Organization that helps people with disabilities to regain a sense of self worth, and seek out better ways to improve their lives. VAI can and does make a difference in so many lives of people with disabilities. Like myself, they have and do learn from VAI that we are ALL good and ‘Valid’ people! Even if some judgemental people look down on us, and try to label us as ‘Invalid’ in RL.